The Dallas Police Cycling Team will once again participate in the Annual Police Unity Tour Chapter IV- Virginia Bicycle Run in honor of Dallas PD Fallen Officers in Washington D.C. 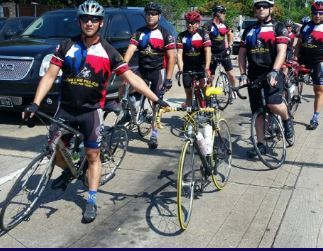 The Dallas Police Cycling Team is a non-profit organization created in June 2014 to raise awareness of Law Enforcement Officers who have died in the line of duty. This year’s event will be a special honor for our Dallas PD Cycling Team. Our very own Major Max Geron of the Southeast Patrol Division has the honor of delivering remarks for the opening ceremony of the Police Unity Tour Chapter IV Bicycle ride. The 3-day ride begins On May 10, 2017, in Richmond, Virginia and ends at the National Law Enforcement Officers Memorial in Washington D.C. At the end of the 3-day unity ride, each rider will have ridden 226 miles and have climbed over 9,700 feet. On the last day, all nine Police Unity Tour Chapters meet and ride into the National Police Memorial as one large group, which is well over 1,500 cyclists. We want to take this time to acknowledge our officers who will be participating in this enduring and challenging bike run. Most importantly, the cycling team members will ride in honor of our Fallen Dallas Police & DART officers from the July 7, 2016 tragedy. Officers participating include, Major Max Geron, Lieutenant Ernest Sherman, Sergeants Amy Mills and Robert Munoz, Senior Corporals Raymond Dominguez, Humberto Avila, Al Solis, Saul Monsisvais, Monica Almeida, and Police Officers Michael Mayorga and Ashley Parmley.